Learn how to use task queues and Cloud AutoML Vision to label user-uploaded images as a task executing in the background. AutoML Vision can detect and extract information about entities within an image, and let you assign confidence levels to certain key image attributes, such as locations, products, or activities. For example, for a picture of a person, AutoML Vision can give you confidence levels about whether the person is sad, happy, angry, etc, so that you can label appropriately. This page and sample are part of an extended learning example of a simple blog application where users can upload posts. You should already be familiar with the Go programming language and basic web development. To start from the beginning, go to Building an App with Go. There are no costs associated with running this tutorial. Running this sample app alone does not exceed your free quota. Complete the tasks in the Before you begin section in Setting Up Your Project and Application. Then, come back to this page. In this example, you will add code to the gophers-5 sample application. Complete steps 2-6 of Adding Firebase to your project from the Authenticating Users page. app.yaml: Configuration settings for your App Engine application. index.html: HTML template to display your homepage. static/: Directory to store your static files. style.css: Stylesheet that formats the look of your HTML files. index.js: Configures the Firebase Authentication user interface and handles authentication requests. Configure the backend that adds labels and images to user-uploaded posts. Note that this sample uses AutoML Vision. cloud.google.com/go/storage: provides unlimited size limits for image uploads. github.com/satori/go.uuid: creates unique file names to store uploaded images in your Cloud Storage bucket. google.golang.org/appengine/delay: accesses the task queue API. // A Label is a description for a post's image. The labels with the five highest scores will show under the image. You will access these fields later with the GetDescription() function and the GetScore() function. The ImageURL field is a public Cloud Storage URL to the uploaded image. When a user uploads an image to your page, your indexHandler function will add the image to your Cloud Storage bucket while asynchronously adding labels to the given image. Create the labelFunc variable which creates a task to label the uploaded image with Cloud AutoML Vision. This task is added to the task queue, so that work can be executed in the background. If a user uploads an image in a post, your indexHandler function calls the labelFunc function. // the function will be retried. // Get the post to label. // Create a new vision client. // Get the image and label it. // Update the database with the new labels. Create the uploadFileFromForm function which confirms the user-uploaded file is an image, then creates and returns the image's public Cloud Storage URL. // uploadFileFromForm uploads a file if it's present in the "image" form field. // Read the file from the form. // Ensure the file is an image. http.DetectContentType only uses 512 bytes. // Reset f so subsequent calls to Read start from the beginning of the file. // Create a storage client. // Random filename, retaining existing extension. // Warning: storage.AllUsers gives public read access to anyone. // Entries are immutable, be aggressive about caching (1 day). // Get the image if there is one. params.Message = post.Message // Preserve their message so they can try again. // Only look for labels if the post has an image. // Run labelFunc. This will start a new Task in the background. In your index.html file, update the form to accept image submissions and show images and their labels in the user-uploaded posts. Add the enctype attribute with the multipart/form-data value to the form tag in index.html. This is required when using forms with a file upload control. Run and test your application using the local development server (dev_appserver.py), which is included with Cloud SDK. The local development server watches for changes in your project files, so it recompiles and re-launches your application after you make code changes. 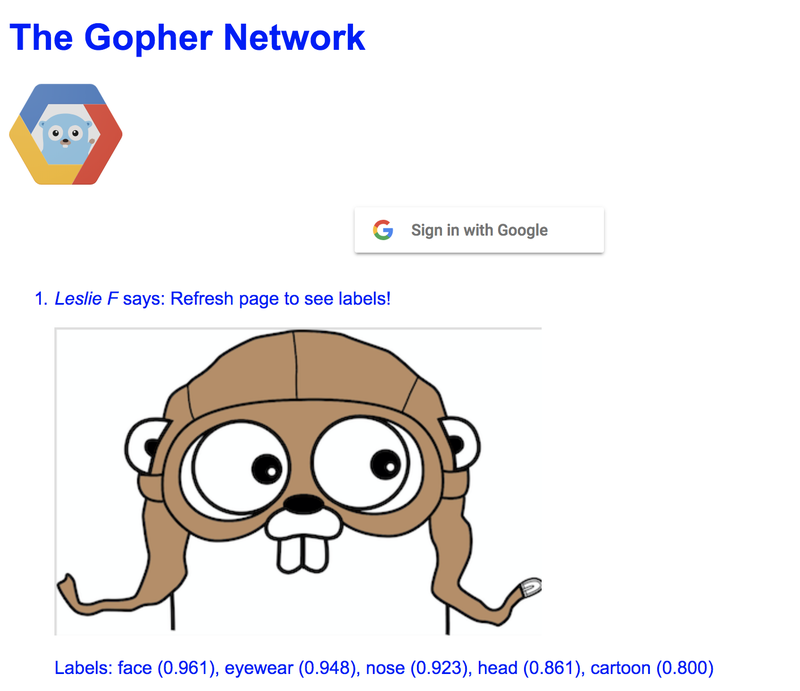 Try it now: Leave the local development server running and then try editing the index.html file to change "The Gopher Network" to something else. Reload http://localhost:8080/ to see the change. Learn more about writing application logs and interpreting system logs in Reading and Writing Application Logs. For a deeper dive into how App Engine works, see the Go Runtime Environment. Read about request handling and request routing.